Now that I am actually aware that several of my family members do read my blog, (thanks guys! ), I feel like maybe I should make things a little more PG rated. Not that I’m censoring of course, my life is very PG and there isn’t a single drunk photo of my anywhere. But anyways, on to the story of this lasagna. 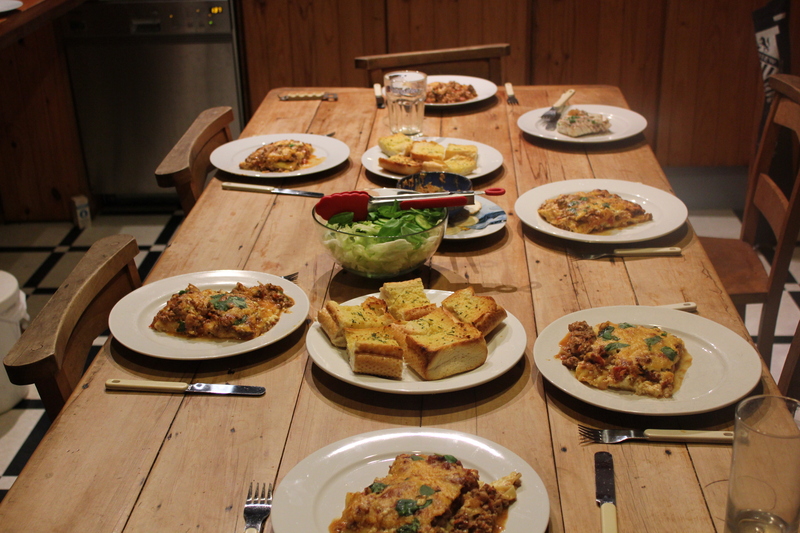 The first time I ate this lasagna, I had had a lot of….apple juice. And that apple juice was making me very happy…and chatty…and giggly…and dance-y. It was just magical apple juice all around. And so, when I first ate this lasagna I thought it was the golden god of lasagnas. Seriously, it was a legit party in my mouth. So, when I decided to make it again, I was a little wary. I didn’t have quite as much apple juice on hand and I thought the lasagna might taste a bit, well, different. But gloriously, it did not. 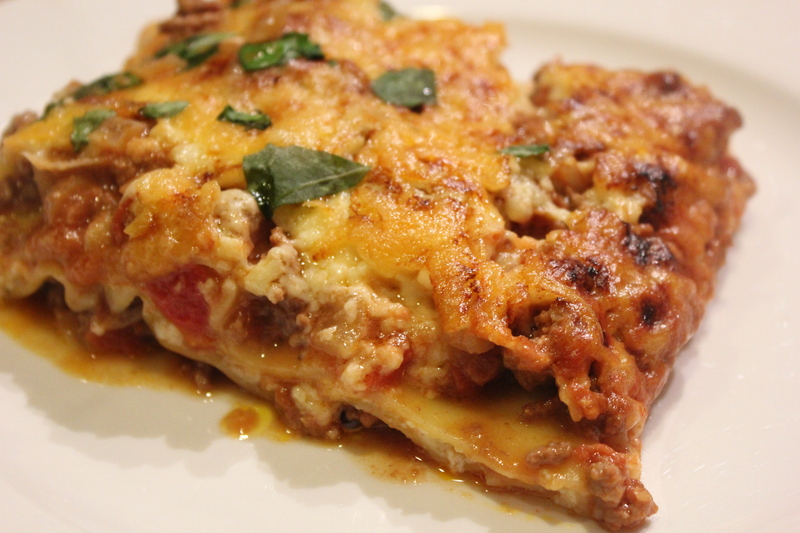 Apple juice or no apple juice, this lasagna is the bomb. So I suggest you make it. This recipe comes from my dear friend Mariann Foll. All the way from Norway, thanks love. Saute the onions until soft and then add the meat. Continue to cook until the meat has mostly browned. Add the chopped tomatoes, tomato paste and water / milk. Simmer for 10 minutes, and season to taste. Melt butter / heat oil, stir in the flour and dilute with milk while stirring rapidly. Cook on low heat while stirring. Let simmer for 5 minutes, add the cheese and season to taste. 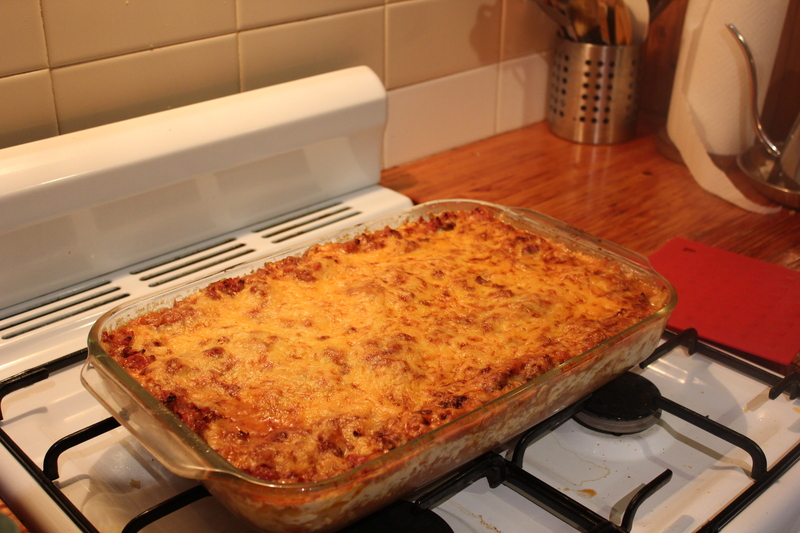 In a casserole dish, add a layer of meat sauce, then the lasagne sheets and white sauce. Add one more layer of lasagna sheets, another layer of meat sauce and cover with cheese. Bake in the oven for 30-40 minutes – until the sheets are soft. Leave the lasagna for 10 minutes after baking, so it will “set up” a bit. Served usually with a salad and garlic bread. 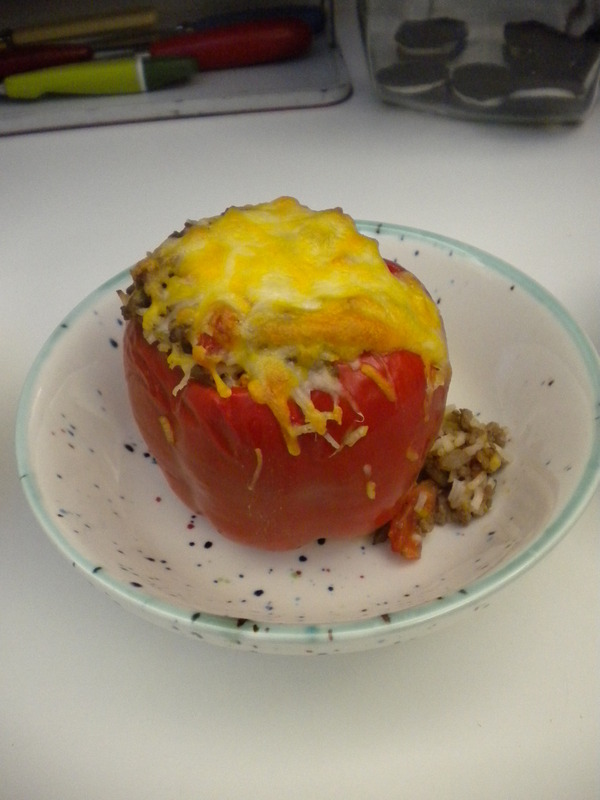 There are many possibilities in the world of stuffed peppers, you can pretty much fill ‘em up with whatever you like. I was in the mood for something traditional so I went the all-American route of stuffing them with beef and cheese. This is the recipe I used adapted from Thru The Bugs On My Windshield. The original recipe has a few more ingredients, which probably make it a bit tastier but since I was trying to stick to ingredients that students can easily afford I cut them out. Overall the peppers were pretty tasty, I would have thrown in some more spices and herbs to the ground beef mixture, a bit of oregano, garlic salt, and maybe some Italian seasoning, since it was a bit dry. But if you don’t want to splurge on buying spices, since they are a bit pricey, I would recommend just throwing in a bit more cheese in the beef mixture because it adds a little moisture. The recipe was overall very easy to do, and the idea of microwaving the peppers instead of steaming them is brilliant because it’s one less pot to clean and it is much quicker. 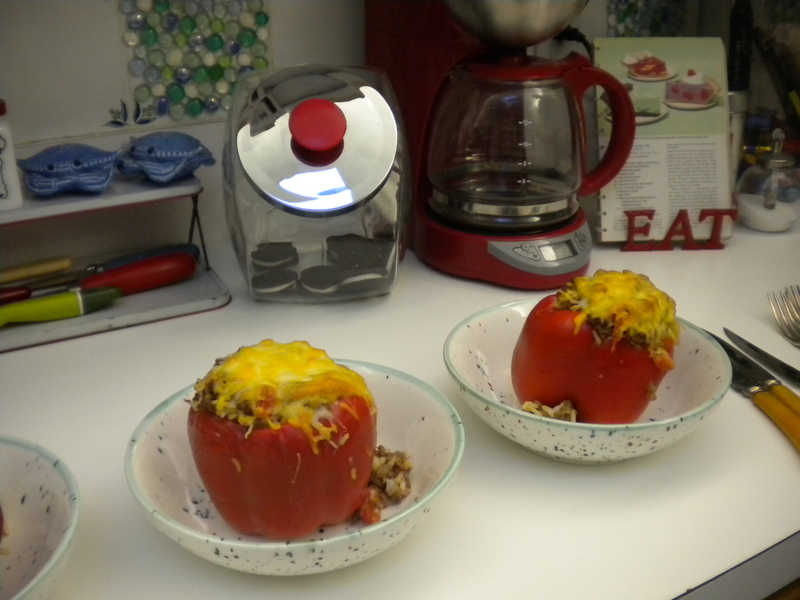 Stuffed peppers are also incredibly versatile so if you wanted to make a vegetarian version just substitute the ground beef mixture with a mix of couscous, mushrooms, carrot and frozen peas and voila. Let me know what you think! Cut the tops off the peppers, just below the stem indentation. Take seeds out of the bottom and discard. Rinse peppers thoroughly and place in a small microwavable baking dish, open side up. Microwave on high for about 4 minutes, or until slightly steamed. This takes the place of having to parboil them in a big pot of water. While the peppers are in the microwave, mix all the remaining ingredients, except for 1/4 cup of the cheese, in a large mixing bowl. Incorporate well. Remove peppers from microwave and stuff with your ground beef filling. Top with remaining cheese and bake in the oven at 375 degrees for 20 minutes.